Before drawing a close on 2016, the Nua Healthcare outreach team carried out their final visit of the year to see Eddie during his work on site in Fastway where they were very impressed by what they saw. Eddie was working away amongst a team of other men who were all gathered around in a team, sorting parcels and dispersing them to containers located around the large warehouse. Eddie was in the centre of the group, busily working and conversing with his work mates. Reports from Eddie’s Supervisor, Jay, have always been positive, and when the team spoke with Jay on that particular evening, he stated; “Eddie is one of the lads, he arrives and gets on with the work, there’s never an issue. Eddie was presented with an official Fastway uniform on his birthday, something not all employees have been awarded”. 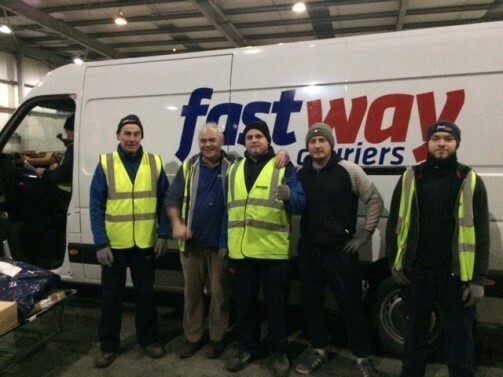 It was very clear to me that Eddie is well and truly a valued member of the Fastway team and it is his hard work and dedication that should be commended, as it is this that has earned him this good reputation. Well done Eddie and keep up the great work.